afrol News - Gambia Dictator "lied about Obama award"
Gambia Dictator "lied about Obama award"
afrol News, 27 September - The Gambia's state-controlled media were obliged to make large headlines from a Statehouse announcement, President Yahya Jammeh had "bagged four awards," and even been called "an inspirational leader" in a letter by US President Barack Obama. The White House denies any such awards or letters. The Gambian Dictator already is known to have an honorary title fetish. Although never having received formal education, he insists on being called "His Excellency Sheikh Professor Alhaji Dr. Yahya A.J.J. Jammeh" in official documents and in Gambian media. Government's official "Statehouse" website is better characterised as President Jammeh's personal blog, with links to "websites of other world leaders." A large part of the official statements heralded on the site include Mr Jammeh's alleged private charity initiatives and an ever growing list of international awards being given him. The last four awards, heralded on 16 September and given great coverage by the heavily censored 'Daily Observer', caught the interest of Frank Smyth and Mohamed Keita of the New York-based Committee to Protect Journalists (CPJ). Mr Smyth and Mr Keita in particular had reacted to the surprising official Gambian statement holding that "a letter accompanying his two awards the US President Barrack [sic] Obama described President Jammeh as an inspirational leader and thanked him for his exemplary dedication, determination and perseverance for the development of The Gambia as well as the advancement of humanity at large." As the journalists contacted the Obama administration in Washington, the Gambian Statehouse and media claims turned out to be false. White House National Security Council spokesman Bob Jensen answered CPJ's request: Regarding "your query asking for confirmation of Gambian reporting on the Gambian president receiving awards and a letter from President Obama. Those reports are incorrect. The Gambian president did not receive what the media reports are claiming." This inspired Mr Smyth and Mr Keita to continue their research and question the four awards given President Jammeh. One award turned out to be real; the "Nebraska Admiralship" or award denoting Mr Jammeh as an "Honorary Admiral" in the fictitious "Great Navy" of the landlocked US State of Nebraska. The award "is meant to be a ceremonial acknowledgment of Nebraskans who have shown outstanding citizenship," noted Nebraska governor's office spokeswoman Jen Rae Hein in a statement to CPJ. "We regret that this individual has attempted to embellish a certificate for a Nebraska admiralship, claiming that it was a high honour bestowed upon him by the governor, when to the best of our knowledge, this person has no relationship with or ties to Nebraska," Ms Hein added. She further noted that the Nebraska governor's office routinely processes thousands of admiralship requests annually. The Gambian State House website reported that three of the awards, including the Nebraska admiralship, were presented to President Jammeh in Banjul by an official from a Sicily-based organisation called the International Parliament for Safety and Peace (IPSS). The IPSS, according to Mr Smyth and Mr Keita, "has been reportedly accused of providing credentials to educational institutions otherwise not accredited in their own nations, and of selling membership, titles and other distinctions for fees." The fourth stated honour was an "Honorary Vocational Bachelor's Degree" bestowed upon Mr Jammeh by the "Printers and Publishers Guild of Northern Germany." German authorities however told the CPJ researchers they found "no record" of any such award. "Extensive Internet searches in English and German revealed no such guild or other organisation with a similar name," the researchers added. 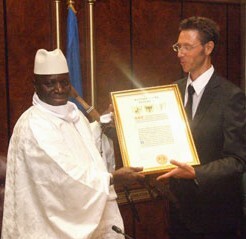 The four "honorary" awards given the Gambian President therefore turned out to be empty or false. Also the "accompanying letter" from President Obama proved to be a lie. It is not the first time President Jammeh is caught lying about prestigious awards allegedly given to him. The last time was in July, when Gambian Statehouse and the 'Daily Observer' loudly announced that the International University of Fundamental Studies (IUFS) in Russia conferred on President Jammeh "a prestigious Grand Doctor of Philosophy Honoris Causa in International Relations and Diplomacy." "This latest academic laurel for President Jammeh is in recognition of his outstanding service to humanity, his role in fostering peace in the sub-region, as well as his efforts in the improvement of the socio-economic sectors of the country," the announcement said. The 'Daily Observer' added that the award "comes at a time when the Gambian leader's achievements within and outside the country are being recognised universally." Also this honour seemed greater than it was. The IUFS is known as a bogus university, a so-called "degree mill", selling degrees and titles to anyone at a price of US$ 1,000 to US$ 10,000, afrol News research could establish.